D’Artacan spends the night at the house of Juliet’s uncle. 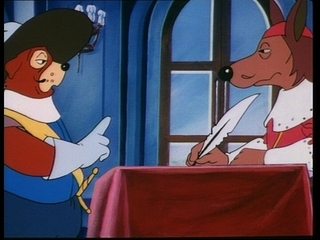 Meanwhile, Cardinal Richelieu is hatching a plot with Widimer, Captain of the guards, to discredit the MuskehoundS. A double of Pontos is seen robbing ladies in the street by D’Artacan. However, the real Pontos is shown innocent when his friend AMIS produces the double, who is promptly shot by Widimer. D’Artacan accuses Widimer of being involved in the plot.